“Should I use a British Airways family account to combine points?” is a regular question asked by British Airways Executive Club members. Whilst the ability to combine a family’s Avios points provides most members with the opportunity to both collect and use more points, there are a couple of sneaky T&Cs which you should be aware of before signing up to a BA Household Account. During this guide to the BA Avios Household Account we’ll look at the good, the bad and the ugly as well as running through various examples to give you the information you need to make the best choice. Talking of choice, following the closure of the Avios.com scheme in June 2018, Avios points holders no longer have the option of setting up an Avios.com Family Account. This has at least simplified things, with the only option now through the BA Executive Club. If you weren’t to create a Household Account there is only one other alternative method of sharing Avios. Through the British Airways website you can pay to transfer miles between Executive Club members. There is a cap of 27,000 Avios per person each year, and with a cost of £175 for up to 27,000 points, the recipient is essentially paying 0.65p per Avios point to receive these. As you’ll learn from my recent guide to buying Avios this doesn’t make much, if any, sense! Where the ability to combine Avios points through the BA Household Account provides real value is when you’re redeeming a 2-4-1 voucher earned with the BA Amex. The 2-4-1 voucher allows two people to redeem Avios reward flights for the number of Avios required for one person. With the ability to save up to 200,000 Avios points this is by far the most generous credit card perk currently offered in the UK market. 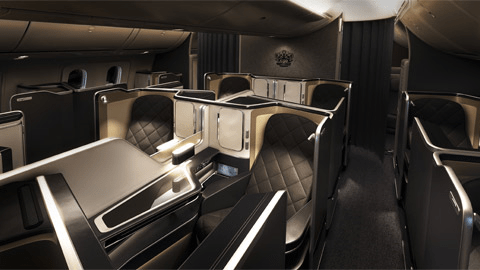 You can read how I recently used mine for a First Class British Airways flight between London and Sao Paulo in my full review found here. There’s also a step-by-step guide to earning enough Avios points for a similar First Class flight which you may find helpful! 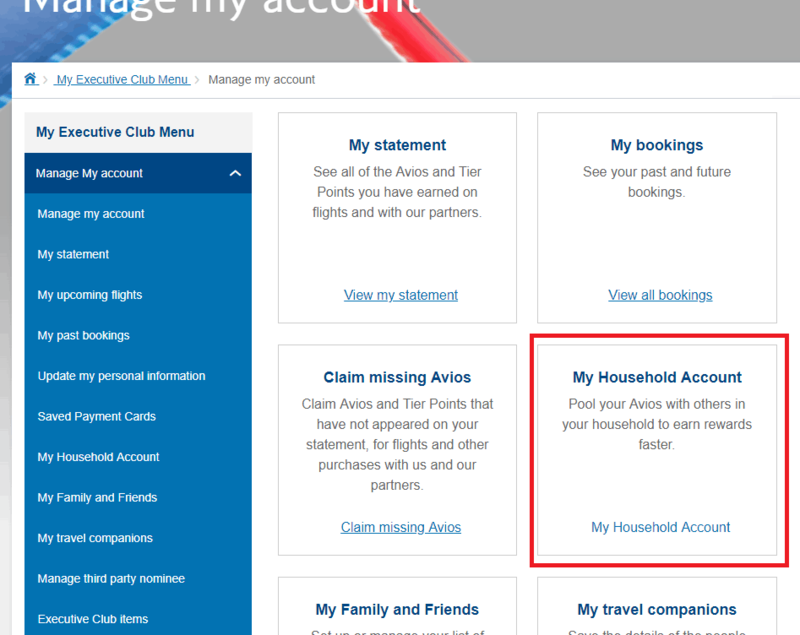 What is a BA Avios Household Account? Does the Combine My Avios Function Still Work? British Airways offers the ability for up to 7 members of a household to combine their British Airways Avios accounts to provide full use of a collective balance. Whilst individual members’ balances will be shown separately alongside a household balance, all redemptions will be made on a pro-rata basis from the balance of each person (even if they’re not travelling on that redemption). This means that if you redeemed a 60,000 point flight and you have 60,000 points and the other member of the BA Household Account has 30,000 points, then 40,000 will be taken from your account and 20,000 from your partner’s account. However when an individual earns points (either from a credit card or flying with British Airways) it will be allocated to their points balance as opposed to being split on a pro-rata basis between the members of the British Airways family account. The BA Avios Household Account is great for families. This is because children under the age of 18 are ordinarily unable to set up an Executive Club account to either earn Avios or Tier Points. However, with a BA Household Account you’re able to connect an under-18 account, ensuring you (or your children) don’t miss out on Avios points which can be earned on flights taken! We’ll touch more upon this later. One of the main areas of confusion as to whether signing up for a British Airways Household Account is a good idea relates to a couple of pesky terms and conditions. Let’s take a look at the most important T&Cs – a full list can be found here. Maximum of 7 people. Whilst this may impact large families, I wouldn’t envisage it providing too many problems. All members must have their BA account registered at the same address. I would only envisage this being a problem when either children have left home or you’d like to incorporate grandparents, who rarely fly but may be sitting on a large Avios balance, into the British Airways Household Account. Only one change to the BA Household Account can be made every 6 months. This has a couple of repercussions. As setting up the BA family account is classified as making a change, you can’t then cancel the account (again making a change) in the first 6 months. Similarly, once set up, you wouldn’t be able to add new members in the first 6 months. The Head of Household can add a further 5 people to the account as ‘Family and Friends’ allowing flights for these people to be booked using the balance of the Household Account without however merging their points in the BA Household Account. Ordinarily you can redeem your Avios points for other people’s reward flights without a cap. As such by limiting it to just 5 people, which can only be changed every 6 months, this could have implications for those who regularly redeem reward flights for others. Firstly you’ll need to decide who the Head of the Household will be and then log in to their BA Executive Club account. On the ‘Manage my Account’ page proceed to the ‘My Household Account’ page of the BA website – also found here. Proceed to ‘Create a Household Account’. You will then need to add the details of the various other members who will form part of the BA Household Account. An email will then be sent to each member and the T&Cs have to be accepted by everyone. At this point the Household Account will have been set up. The ‘Head of the Household’ will then be able to add children to the account. Simply head to ‘Manage My Household Account’ and then ‘Add New Member’ – the application will not be rejected for an under-18 unlike the standard application form. Once the BA Household Account has been set up, any one of the members can redeem flights using the combined points balance for either themselves or any of the other members or 5 nominated family and friends accounts. As mentioned earlier, the redeemed points will be taken on a PRO-RATA basis from each of the members within the Household Account. Strangely, and I have to admit I’m not 100% sure why, whilst you can move Avios points from an account within the BA Household Account to Iberia, you CANNOT however move points from Iberia to a British Airways Household Account. As such it’s worth considering combining all your Avios points within your BA Executive Club account before you set up a Household Account. As mentioned earlier, children (under 18) cannot set up their own BA Executive Club account however can be invited to join a Household Account. 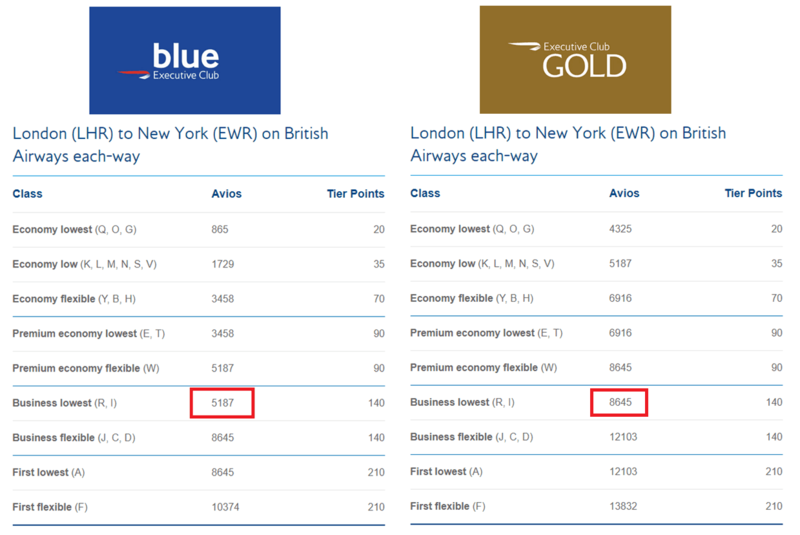 As such if you were to take a family of 4 (2 adults, 2 children) away on holiday to New York purchasing Club World tickets in the recent sale for a little as £1,250 per person, you’d earn between 10,374 and 17,290 Avios for each return flight depending on your BA Executive Club status. Without being able to claim the two children’s miles you’re possibly missing out on up to 34,580 Avios points! 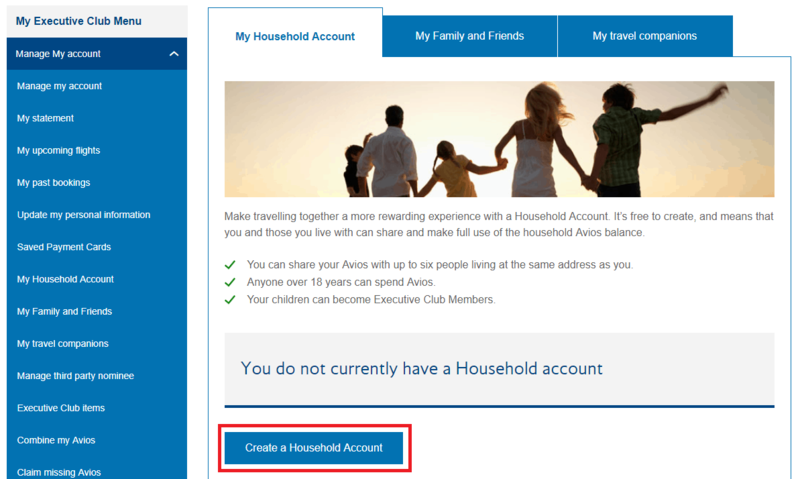 If you don’t want to personally be restricted by being part of a Household Account then you may want to consider an alternative way of ensuring you don’t miss out on the possible Avios points. In this instance your other half could open a Household Account and add the children to that account. You could then be added to that Household Account as a ‘Family and Friend’ member which would enable the points earned within that account to be used for your reward flights. Can you have members of a BA Household Account with different addresses? All of the BA Executive Club accounts need to be registered to the same address. If, say, your child has gone off to university but keeps their mailing address at home this should be fine. If you’d like to book flights for someone at a different address then you’d need to add them as one of your 5 ‘Friends and Family’. How else can you share Avios? As I mentioned earlier, the only other way of sharing Avios is by paying a fee. However at a rate of 0.65p per point, this is almost the same price as you can purchase Avios and as such wouldn’t be worth it. 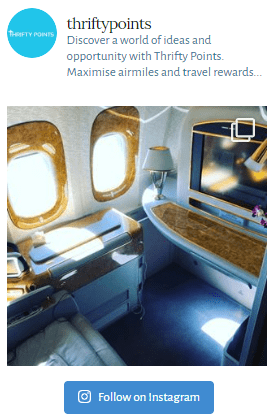 Especially when compared to some of the excellent Avios earning opportunities such as the 20,000 Avios sign-up bonus offered by the (free for the first year) American Express Gold Card – reviewed in full here. You can increase the number of points you earn to 22,000 by using this referral link. 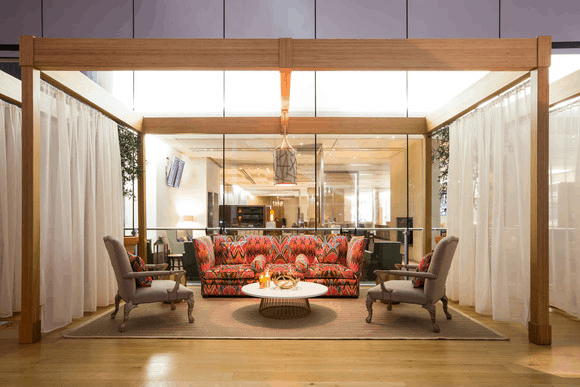 Can you use a BA Household Account for lounge access? Unfortunately a British Airways Household Account only pools Avios points rather than the benefits of elite status earned through Tier Points. Don’t forget though, for BA Silver and above, the Executive Club member can bring one guest to a lounge when travelling with BA. When redeeming reward flights the points are taken on a pro-rata basis from all accounts – they cannot be taken individually. This may be unfair if the person with the most points isn’t travelling on that redemption. You cannot transfer Avios from Iberia to a Household Account.